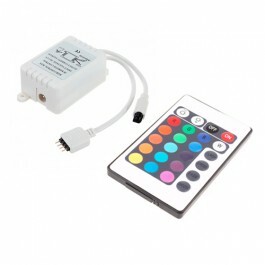 This IR (Infra Red) Controller and Remote can be used in conjunction with any of our colour changing RGB LED Strip Lights. Using the IR Controller/Remote, you can wirelessly control the settings on your strip lights, choosing from one of 16 static colours and 4 dynamic modes. A user guide is included and will help you get started. As this is an Infra Red Controller, you will need a direct line of sight between the remote and red eye sensor in order to use the strip lights. The sensor is attached to a length of wire for optimum placement. The input voltage of this product is DC12~24V; never connect to AC240V. Never connect two wires directly in case of short circuit. Lead wire should be connected according to colours that the diagram in the instructions offers. Warranty on this product is 2 years. During this period we guarantee replacement or repair on faulty items, but exclude any damages caused as a result of misuse.